← Art of the print…. 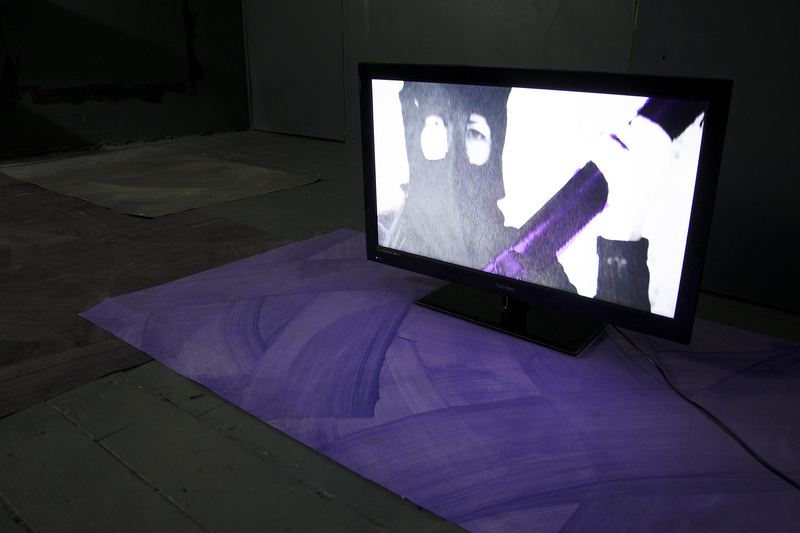 The title and some sentences from texts by Valerie Solanas and Ulrike Meinhof introduce the viewer to Dziubak’s installation of lens based art made during her residency at the Array Studios. he interpreted her fight as an expression of her love for humanityIn three separate recordings, projected simultaneously, the “array of negative feelings” included a kind of chronicle of recent groups who failed to separate fighting for freedom from violence of terror. 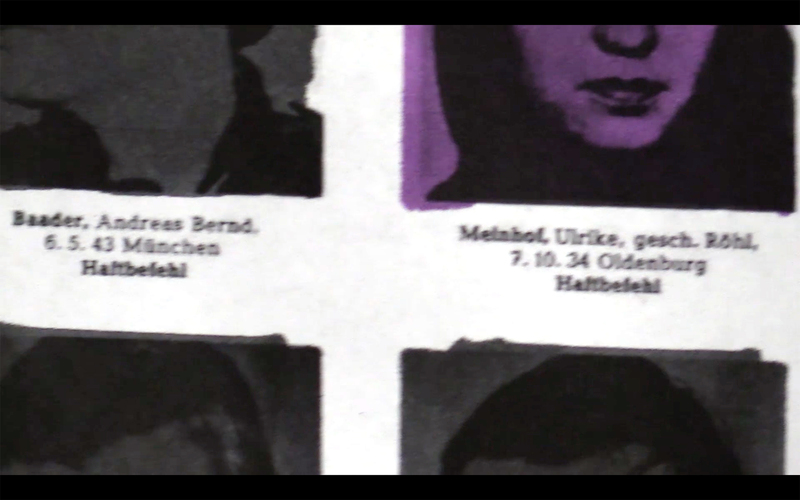 Archived images from media recall the Troubles in Northern Ireland, IS, and the Baader Meinhof Gang which caused mayhem across West Germany with its politically-motivated assassinations, bombings and kidnappings. Dziubak delivers shabby fragments as if to debunk the myth of 1970s terrorist chic. Without pointing out any hierarchy of value the video glides over from fragment to fragment without escaping unfortunate equivalency of historical events. 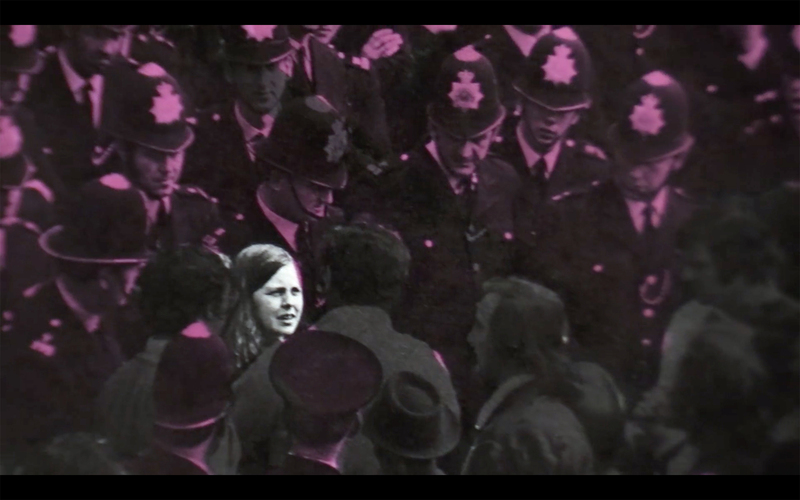 So a group of women protestors during the Spanish civil war against fascism is silently appearing next to Bernadette Devlin, an elected member of UK Parliament. 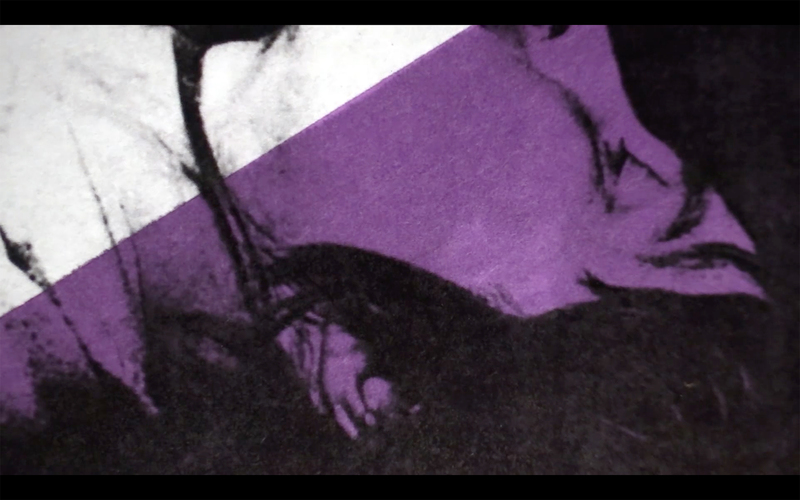 Notable use of purple hue is puzzling, no less so, that the juxtaposition of many different histories. The group of women workers faces no visible danger, whereas Devlin is surrounded by a mass of police helmets without exit. 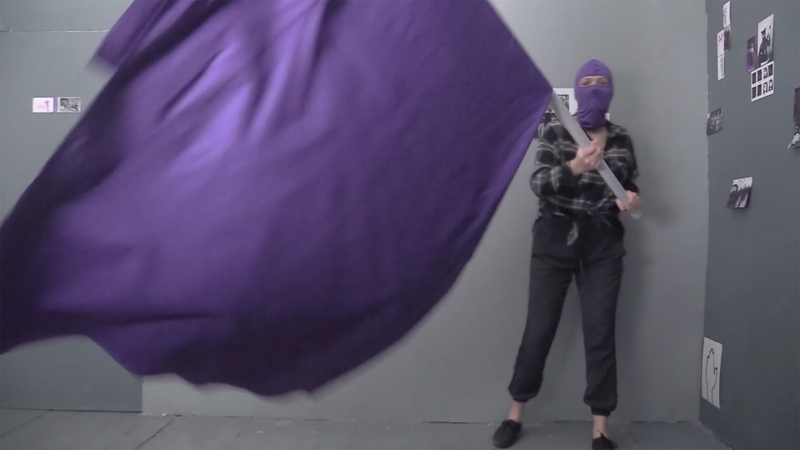 The purple hue is in both images on the “side of the protest”, once as personal visual calls, once as a power to silence one. On this film there are sketches and prints from archives and my own juxtaposition of them. The same pictures are at the background of video with performing person. 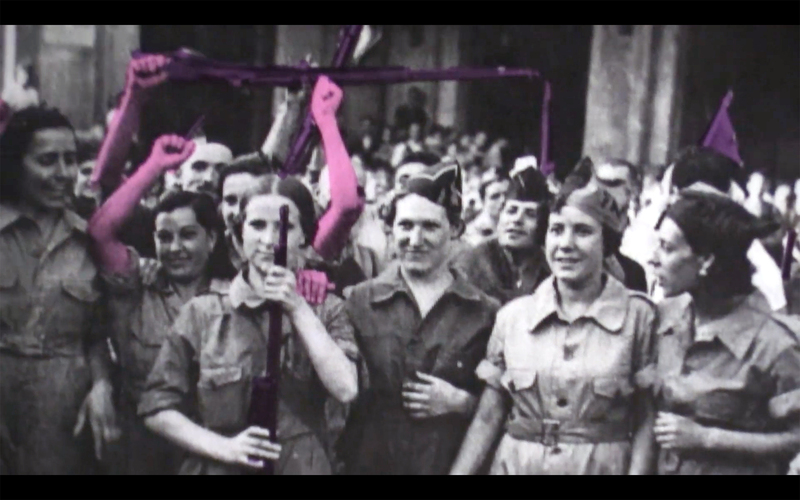 I made interventions in those photos, deleted males, marked important gestures and characteristic elements by colour purple. At the project space during “large array of negative feelings” I decided to show only one sketch (dancing soldiers in the forest) at the cabinet in the middle of height. Dziubak deliberately abandonned the colours with established and recognisable symbolic meaning, like national flags. 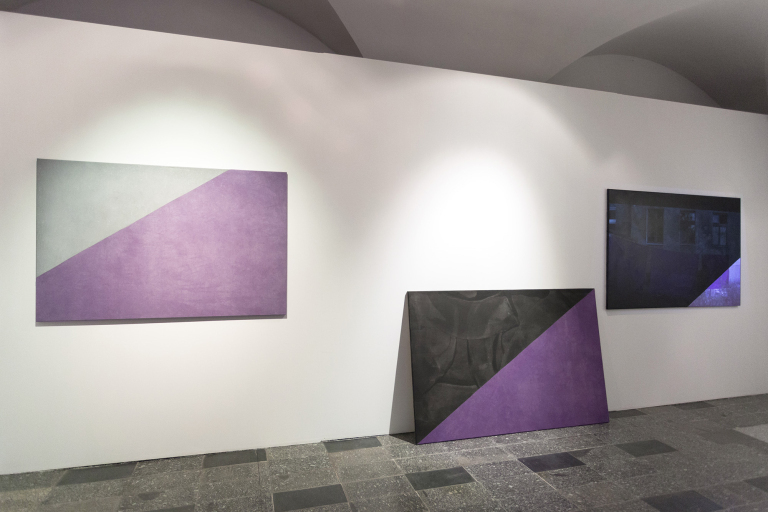 Her interest in purple as a meme preceded the ” array of negative feelings”. The “array…”video relates narrative that would be less familiar to younger viewers. There is nothing inherently exciting about the whole. Stills, like the one with Bernadette Devlin are independent of previous knowledge of historical narrative. That image shares with Dziubak’s abstraction the power to marshall exciting recognition of fevered anarchy of meanings. And the consequent catharsis. Dziubak is sincere about codes of belonging as she includes her insecurity of judgement, as to who is the target. Whereas – pinning clearly the answer to what is the target – the ravine between those who do and do not feel deeply injured by the terror of any kind. The consequences are not isolated, just tacitly presented or implied. Frederico Garcia Lorca deployed “the many angels of intelligence” – an option manifested in Dziubak’s choice of pantomime and performance. 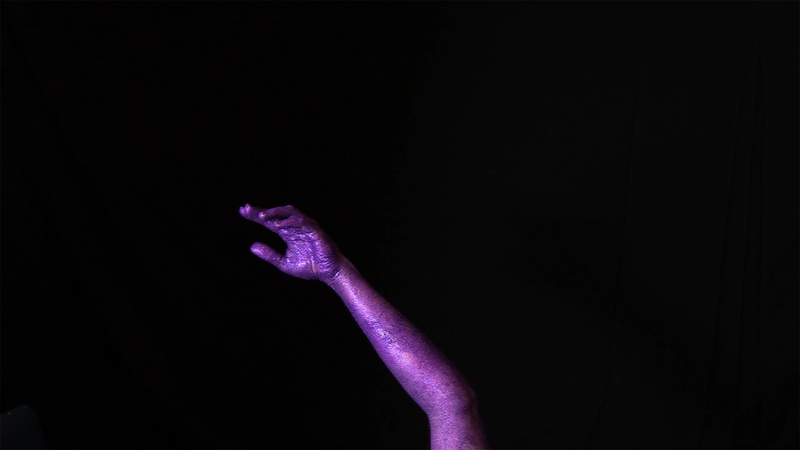 One hand, two hands, three hands, covered in purple glitter , move in front of the lens, morphing at time into a cobra like creature, dancing to a fakir’s tune. Unashamedly anthropocentric it loses its anthropomorphic look now and then, creating insights that easily slide across the surface and off the target. It stimulates my ways of seeing and thinking – as any poetry would. Art is not rootless, the consequences of viewing are not isolated, they cascade through the viewer’s aesthetic experience in somewhat unexpected way – akin to a free thought. The Hand rejects a hierarchy of structures, it is attuned to the stream of images not pinned to specific event, time or place. The presence of that kind of freedom is its strength. The last video is partly attuned to local ( flag protests and flag waving) and wider ( flags on tanks, lorries in war conflicts) contexts of collective memories. Even though it has a long history of association with kings and rulers, purple is rarely in modern national flags. Only one country, Dominica, uses it in their flag. The most important moment for my research was, when I found an old US stamp with Susan B. Anthony (original purple). This colour have a revolutionary potential – there is no purple in national flags but the radical anarchy – feminist movement- is using this colour in diagonal combination with black. Stamp with Susan B. Anthony was a starting point to look for female freedom fighters, soldiers even terrorists in archives. 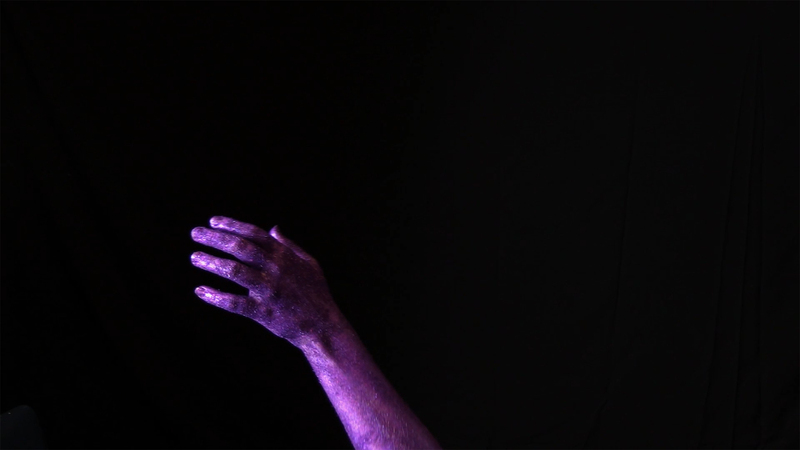 I decided to set video – performance and video with hand as a pair. Small tv is stand at the metal cabinet, opposite the wall (on this wall I recorded all performative actions). 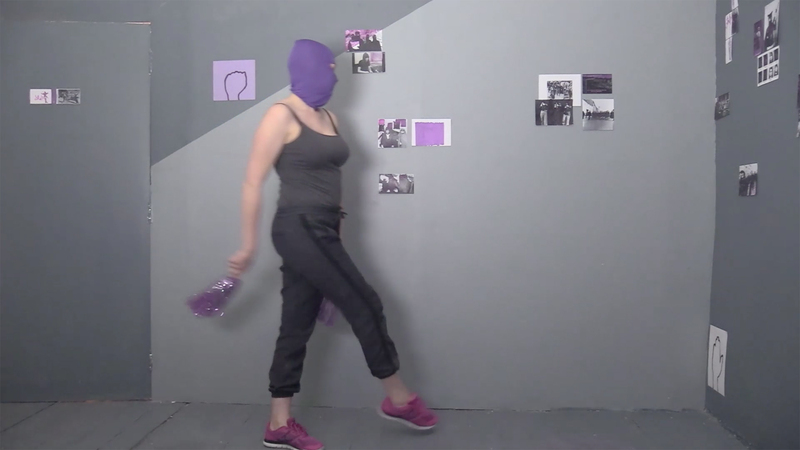 Person in balaclava dance and perform with music. At the floor, there is big tv with minimalist picture of purple hand. Shiny hand is dancing / swimming in the darkness. Audio remix of “Revolutionary Etude” from performance is somehow connected also with this picture. The hand is looking for balance between left and right side of the screen frame. Dynamic of action in both videos is completely different. Hand seems hypnotising but on video with a person in action things are changing very fast. Figure disappear and new action is starting. The colour purple is often associated with wealth, status, luxury, power and also with states of mind like wisdom creativity, dignity, devotion, peace, mystery and independence. The shoe, sheet of paper and balaclava evoke the relationship of objects, motifs and thoughts favoured by the Surrealists(Lautreamont) definition of their art as the fortuitous encounter of a sewing machine and an umbrella on a dissecting table. The whole is deliberately fragmented as if to forbid/frustrate one continuous narrative. People claim that purple uplifts, calms the mind, offers a sense of spirituality and encourages creativity. Amongst the “chakra colours” purple is linked to the brain, to the thought and consciousness. (http://www.sensationalcolor.com/color-meaning/color-meaning-symbolism-psychology/colors-chakras) This art become a meaning when each viewer compoletes it in some way. 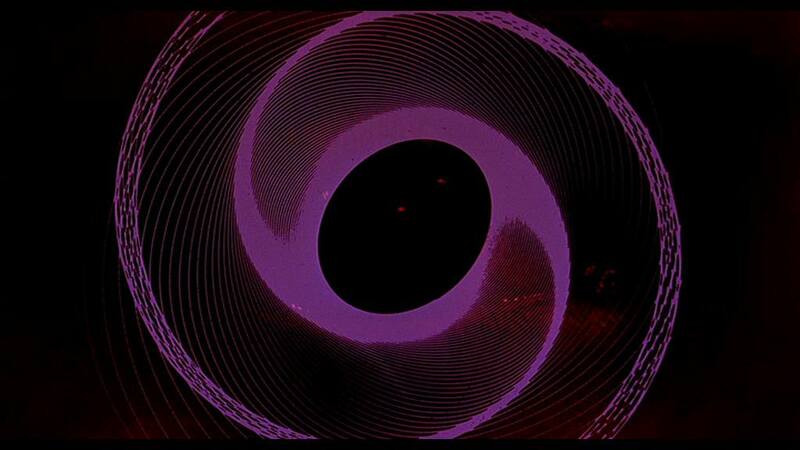 It has multiple meanings like the hue purple itself. In Thailand a widow wears purple. In Japan and Western culture it signifies wealth and royalty.In Egypt virtue and faith. In medieval Britain the purple was colour of mourning. in Iran it significe premonition. The list is long – it includes the popstar Prince and his album Purple Rain.Purple was the color of the first dye made by man. It was called “Mauveine” and was made out of coal tar. The recipe was discovered by William Henry Perkin in 1856. In ancient times the liquid used to create it came from a tiny Mediterranean Sea snail gland. Each snail produced only a single drop of the needed fluid. 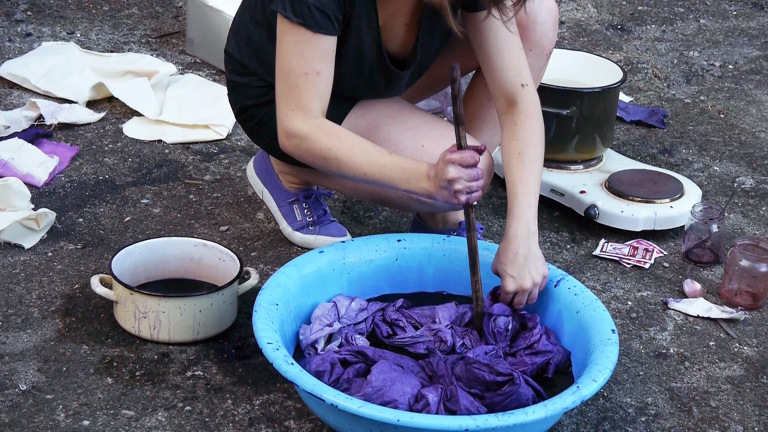 To produce one pound of dye, during ancient Roman Empire times, took the acquiring of four million mollusks.Purple’s rarity in nature and the expense of creating its dye gave it a great deal of prestige. 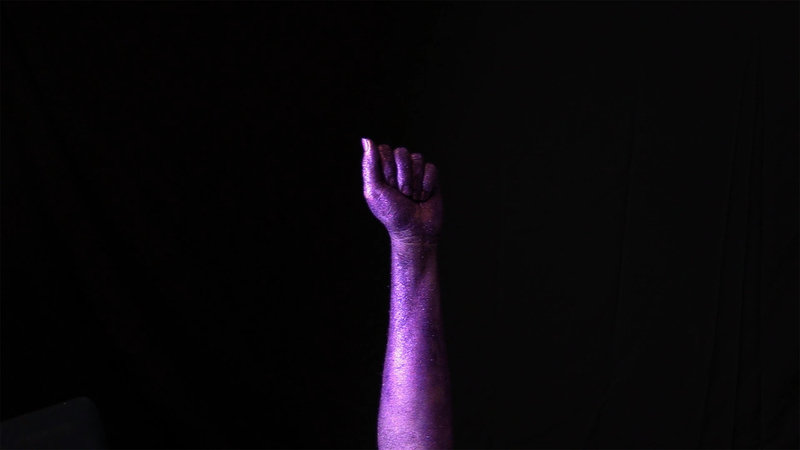 The video with hands is also a tender meditation on loneliness, the performance is also about the collapse of history under the burden of here and now. The third video is also about the possibility and necessity of collective memory, whether dramatised, theatricalized or fictionalised. Does it give you a feeling of a vertigo? This entry was posted in essay and tagged abstraction, Colour Purple, freedom fighter, history. 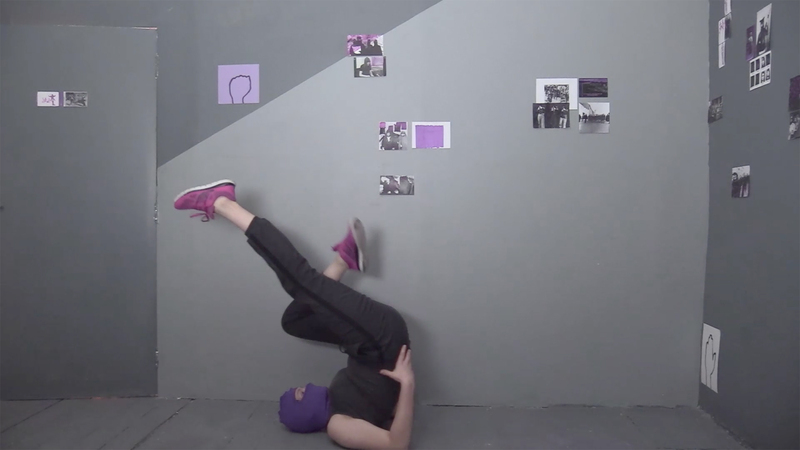 installation., performance to a camera, terror, video. Bookmark the permalink.